The Problem With "Repent Tomorrow"
There is something of a motto in my family. I know it to be from my grandmother, my dad’s mom, though I think she inherited it from her mother. It’s a motto best exclaimed while consuming a piece of chocolate cake, between bites, fork used for flourish: “Diet tomorrow.” We all use the phrase in my family — for some it’s a future commitment to lose weight; for others, like me, “diet tomorrow” is more of a future commitment to deal with the less visible (but not less problematic) results of diet, like high blood pressure. “Diet tomorrow” is the rallying cry of the well-intentioned at the table. It’s “bon appetite,” but with a side of guilt (which makes sense, my dad’s family is Roman Catholic). You’ve been there too, I’d wager. Diet tomorrow. Exercise tomorrow. It’s easier to imagine ourselves eating better and living healthier lives in the future than it is to do so in the moment. I don’t even need to imagine very far into the future — just to tomorrow. Just on other side of a night’s sleep, I can imagine a new and better me. Diet tomorrow. There’s a similar sort of motto uttered by the soul: “repent tomorrow.” As surely as I have eaten chocolate cake and thought “diet tomorrow,” I have sinned, doing something I know I shouldn’t, and thought, “repent tomorrow!” I’ve had one drink too many, or maybe two; I’ve gone to sleep stoking a raging anger rather than saying my prayers; I’ve sent friends and loved ones to voicemail so I could watch TV; I’ve spent hours reading blogs about things I don’t really care about and only minutes reading the scripture. Repent tomorrow! 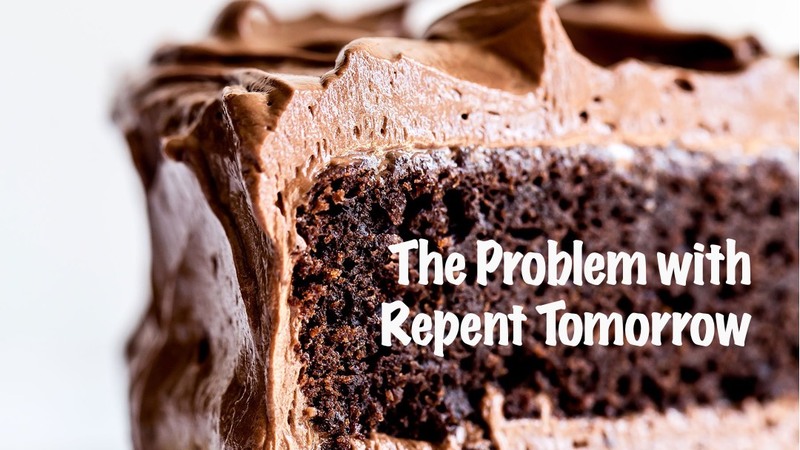 “Repent tomorrow” is as unhealthy for us spiritually as diet tomorrow is unhealthy for us physically. But it’s easy. It’s easier to imagine us being the people we long to be spiritually than it is to be those people in the moment. Just on the other side of a night’s sleep, I can imagine a new and better me. Can you? And yet it turns out, doesn’t it, that the me that wakes up in the morning tends to look remarkably like the one that went to be the night before. And so tomorrow’s me, the one who eats better and repents, that me remains forever just one day out of reach. God knows about this “repent tomorrow” problem, friends. Jesus knew about it. And so when some of those people hanging around Jesus “told him about the Galileans whose blood Pilate had mingled with their sacrifices,” Jesus took the opportunity to address the “repent tomorrow” attitude. Let’s look together at this gospel passage if we could. If you have a Bible and want to go there, we’re in chapter 13 of the gospel of Luke, verse 1. Otherwise, it’s printed on your handout. We don’t actually know from any other first century sources any further details about these Galileans whose blood Pilate had mingled with their sacrifices; Pilate didn’t keep exhaustive records of his brutal reign of terror. But this certainly sounds like Pilate. The idea here is that Pilate — or really his soldiers — had slaughtered some Jews from Galilee (the same part of Israel where Jesus is from) who had come to the Temple in Jerusalem and were offering their sacrifices. So their own blood ran together with the blood from the animals they sacrificed. Do you see what Jesus is doing here? He’s getting at the implicit question — why? Why them? Why those Galileans? And he focuses on the explanation we wish were true, sin. What is the unseen moral calculus that makes sense of this tragedy? What did they do to deserve this? Don’t we long to know the answer to that question? About a thousand different things — from the dead in Christchurch to the bodies scattered among the airplane wreckage to our own hurts and pains and terminal diagnoses. Jesus doesn’t really answer why them. He raises the question and then says “No.” The answer is not that there is some moral math problem that determines who lives and who dies. Sinning doesn’t raise your risk of tragedy. This is distressing because, if you don’t have to be especially horrible to meet a sudden, violent end then...then it could happen to you too. Jesus says, “Unless you repent, you will perish too.” Don’t rely on “repent tomorrow,” because there might not be a tomorrow. There might not be a tomorrow. You keep getting one more chance until there are no more chances, until the tower falls on your head too. Until the drunk driver careens across the median; until the fire erupts in the attic, until the boat capsizes; the tornado comes; or the heart attack seizes your chest. There was a 1st century Jewish rabbi (roughly the time of Jesus) from Judea (the land around Jerusalem) named Rabbi Eliezer. Rabbi Eliezer taught that the best time to repent was the day before one’s death. Always repent tomorrow, until you only have one tomorrow left. This idea existed in Christianity too — in the first several centuries many adult converts to the faith would postpone their baptisms until their deathbed, in order to make sure that the forgiveness of sins with baptism covered everything they were liable to do wrong in life. Even the first Christian emperor, Constantine, waited until he was dying before he was baptized. Being emperor, I suppose, entails a lot of sinning — better get them all in first. But the problem, as Rabbi Eliezer’s disciples pointed out to their teacher, is that we don’t really know when we’re going to die. Constantine, lucky for him, wasn’t killed on the battlefield one day — but he could have been. This is true; and this is not the only place Jesus stresses this point. But also, it’s also very hard to live like this. Jesus knew that the fearsome truth that we might die any day true, but also that it is an almost impossible burden to live with every waking moment. God comes to us looking for fruit — for us to share the love and grace and joy and resources he gives us with the world. How’s his search going in your life? Yeah, he has some “Cut it down” days with me too. In this parable, digging and fertilizing is what repentance looks like. We began Lent with a call to repentance, part of me wishes we’d phrased it like this “dig around your life and put manure on.” Putting manure on is not a bad way to describe what Lent’s about spiritually. When we think about repentance, we often think about it as being sorry for our sins and trying not to do them anymore. All this is well and good and true. But what I want you to hear this morning is that repentance is more like fertilizer than just feeling guilty. It’s not just letting go of the sins we seek, but putting into our lives the things that make them bear fruit. It’s not just plugging the holes in your life where the devil gets in, but opening up some windows for God to get in. Repentance looks like picking up the phone and calling your family members, just to talk. Pray. Instead of stalking Facebook for 20 minutes, write a note to an old friend and put in the mail. Read the scripture rather than news. Put away the phones and play Bible Pictionary with your kids. Pray — I know I mentioned that already. Get signed up to run sound, to lead children’s church, to feed the hungry, teach refugees. Seriously, all those things around here could use some people who want to fertilize their lives with that work. Visit a friend who is sick or shut in. Pray — for miracles. I was having lunch this week with a guy, a member of our congregation. He’s been turning away — repenting — from some hard stuff in his life. Addiction, unhealthy habits, pain, depression — so not just sin that’s the wrong things we choose to do, but sin that’s the brokenness that clings to us. And now he’s been working getting rid of the bad stuff — but also on putting in the good stuff. He was sitting across the table from me sharing about how he was trying to figure out what he might be able to do, what he could put into his life so he could bear fruit...where he needed to dig around his life and put manure on. He said this thing that really stuck with me. He said, “I feel like I’ve broken free of these generational sins in my family, what a shame if I couldn’t pass that on.” If he couldn’t bear some fruit. That’s true repentance. That’s God’s work in a human life. While we yet live, we have this chance, through repentance, for Christ to make our lives more fertile and more fruitful. Repentance isn’t just about taking the bad stuff out of our lives, but about helping the good stuff grow. Do the sort of things that bring joy instead of despair, unity over estrangement, forgiveness rather than guilt. The reason to repent today rather than repent tomorrow isn’t just that tomorrow isn’t guaranteed, but that tomorrow, if it does come, will be more joyful and more happy and more fruitful if you repent today. Can you imagine that? So yes, lean into this Lenten season of repentance. Dig around and put manure on. Repentance isn’t just a life with less sin, but a life with more goodness, more God. “Repent tomorrow” impoverishes all our todays. Don’t wait. The Lord wants and offers more for you and for me than that. Dig around your life — pull out the weeds and put manure on. That way, as each today becomes a yesterday, we may be grateful for what all the todays were rather than regretful for what they’re weren’t. That’s some way to live.